Tikidoo makes learning about history fun for everybody. Photo by Tikidoo. A Roman tour company leads kids on adventures through history, culture, art, and architecture in entertaining and unusual ways. And manages to teach a thing or two to know-it-all parents, too. Fathom's Rome-based contributing editor Erica Firpo reports. ROME – It's not easy having a kid in Rome. Strike that: It's not easy having my kid in Rome. Her dad is a peripatetic archaeologist who knows everything Ancient (with a capital A) and her mom is a Rome know-it-all, which means she's already ahead of the game when it comes to culture in the Eternal City. She name-drops piazzas, churches, and monuments while pointing hidden details even I have never noticed. Sure, she uses artistic license — she thinks the Colosseum is her dad's office and Piazza Navona is her playground — but she has just enough buzz words in her back pocket to make her commentary credible. Every now and then, I'll drop her head-first into an unsuspecting tour around the city or inside a museum. I know, I know, it's not fair — we live in Rome and live off our knowledge of the city's historical culture. But it's fun (and necessary) to experience Rome from different angles. Recently, we visited Rome's most famous piazzas and fountains on a Trevi Fountain and Roman Squares Tour with local touring company Tikidoo. To make it more of an adventure, we hitched up with my daughter's best school friend Nicole and her mom. 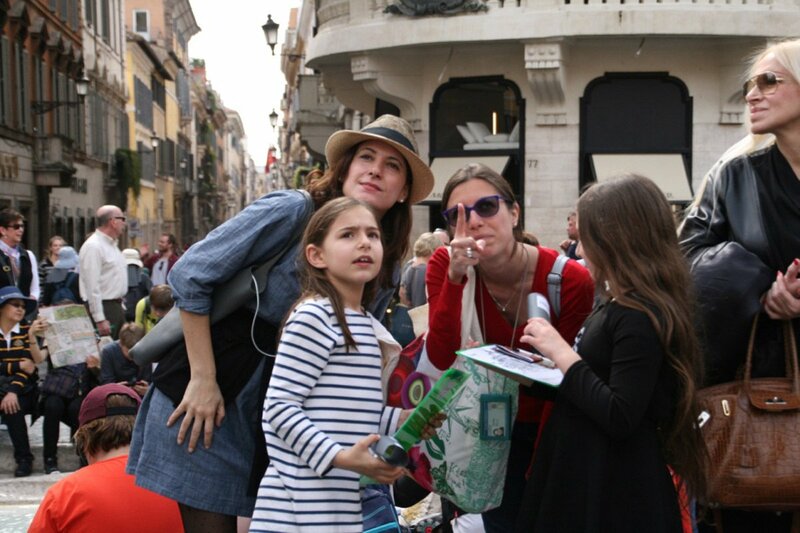 The four of us started in Piazza di Spagna, where we met guide Francesca, as per Tikidoo's directions. Easy as pie for us, but we were worried Francesca might feel like we stacked the cards for this tour. You see, the girls go to school nearby, so the surrounding neighborhood and its monuments are their backyard. But Francesca brought along a bag of tricks — drawing materials, a homemade collimator (a device used in astronomy), organic snacks, and an art history MA, leaving absolutely no room for boredom (for two precocious seven-year-olds) and a lot of room for surprise (for two know-it-all adults) in a mix of Italian and English. We spent two-and-a-half hours rediscovering our neigborhood — from the side streets of Piazza di Spagna to the Trevi Fountain and Pantheon, finally ending up in Piazza Navona, looking at panoramas, investigating fountains, and finding tiny details we've never noticed in any of our daily walks home from school. We were tourists for the afternoon and loved every minute of it. Would I recommend this tour? Absolutely. It is perfect for elementary school-aged children (five and up) and enthusiastic parents alike. What's to love: Tikidoo's tour guides are licensed, knowledgeable, and speak English and Italian. Tikidoo has an app-like interactive website with live chat function, perfect for customizing your experience. Good to Know: Tours for two cost €68 for a group tour or €106 for a private tour and last two-and-a-half hours.